First the good news. In the last 30 years, pork has gotten a lot leaner. This means that from a fat and cholesterol point of view, today’s pork is a lot healthier. Remember the “other white meat” campaign, comparing lean loin cuts of pork to white meat chicken? Now the bad news. In the last 30 years, pork has gotten a lot leaner. That means less marbling and less fat, and an increased tendency for those same lean cuts to dry out on the grill. Well, here at BarbecueBible.com, we try to be proactive, not reactive. Sometimes you have to adapt your strategies and grilling techniques to the foods you actually find at the market. So here are six fail-proof techniques for keeping a pork chop moist—no matter how you grill or smoke it. Brine it. Soak the pork in a saline solution prior to grilling. Thanks to the process of osmosis and capillary action, the pork will absorb some of the brine, resulting in plumper, moister chops. (The meat can increase in weight by 10 percent due to the added moisture.) Meanwhile, the saline solution unwinds the protein strands, making the meat more tender. The basic formula for brine is one part salt (and one optional part sugar) to 16 parts water—i.e., 1/4 cup sea salt and sugar to 1 quart water. Marinate it. Similar to brining in that you soak the chops in a flavorful liquid, but that liquid contains a fat, like olive oil or sesame oil, and it may or may not contain salt or sugar. One great marinade for pork chops is The Only Marinade You’ll Ever Need recipe in Sauces, Rubs, and Marinades. Another great pork marinade is used in this Sweet and Garlicky Pork Chops recipe. Baste it. 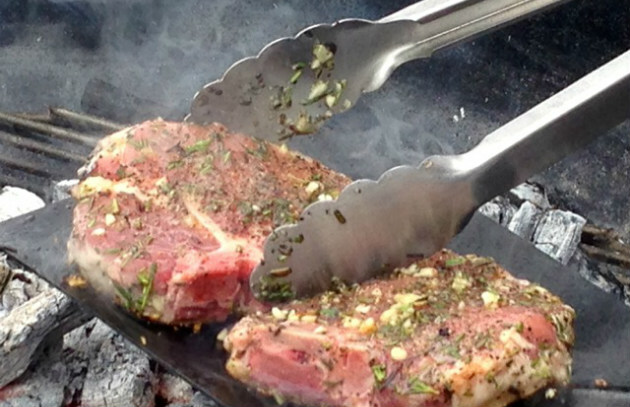 Brush the pork chop while it grills with melted butter, extra virgin olive oil, or bacon fat. Bard it. Wrap the pork chop in a strip of bacon or thin slices of pork fat. This works particularly well for a 1-inch-thick pork loin chop as its edge is about the same width as the bacon. As you grill the chop, don’t forget to turn it on its side so you brown the bacon as well as the meat. Stuff it. Cut a pocket in the side of the pork chop and stuff it with herb butter, cheese, salami, or sausage. It bastes the meat from the inside out. Above all, don’t overcook it. Conventional wisdom about food safety held that you had to cook pork to 160 degrees to eliminate the risk of infection by a parasite called trichinosis. The disease was mostly eliminated in the U.S. by the latter half of the twentieth century. (Isolated cases are still reported to the Centers for Disease Control, but most can be traced to the consumption of wild game like bear.) Today, it is perfectly safe and respectable to serve pork chops pink in the center—the FDA recommends an internal temperature of 145 degrees.